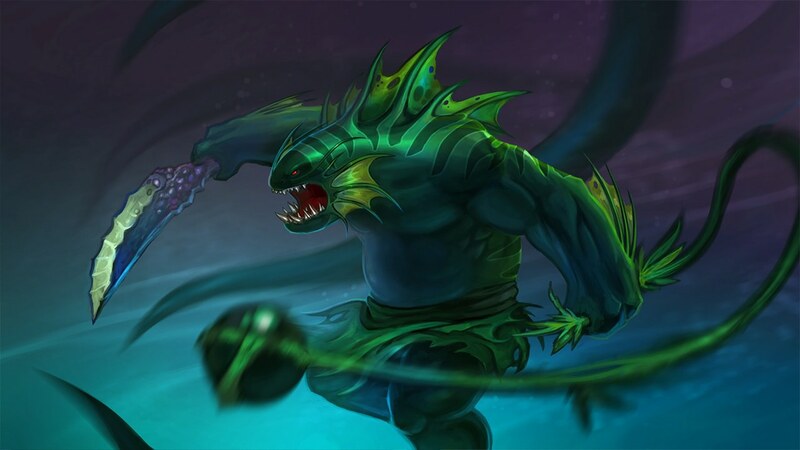 Leviathan, the Tidehunter, is a strength hero famous for his extreme resilience to damage and negative effects, as well as his all-or-nothing teamfight initiating ultimate Ravage. His tough skin, known as the Kraken Shell, allows him to shrug off physical attacks while also shedding debuffs and even stuns and disables. Combined with Anchor Smash—which crushes enemy units in a small radius around him and reduces their attack damage—he is able to farm creep stacks in the jungle with unbelievable ease. It is with this combination of abilities that he is able to farm a Blink Dagger. With his Gush, he is able to damage and slow heroes from a long distance, while also reducing their armor for a few seconds. Once they are slowed, he is able to run up to them to either bash them with his regular attacks, or deal significant physical damage with Anchor Smash. What he is picked for, though, is definitely Ravage—which unleashes tentacles from the ground that immobilize all that may be caught in its wake. If he is able to stun multiple heroes all at once, the teamfight is basically all but secured. Of course, he does not become totally useless once Ravage goes on cooldown. As a particularly tanky hero, Tidehunter serves as a huge distraction during engagements, which is helped by his arsenal of damaging spells. If the enemy team chooses to ignore him, they will find themselves with drastically reduced attack damage and armor. But should they choose to focus him down, he will simply shrug off their attacks and waste their disables. But as with any other hero, Tidehunter has weaknesses that can be exploited. His middling damage throughout the game means that he isn’t a particularly huge threat when it comes to raw power. His sluggish movement and long cast animations also make him rather predictable, and kiting him as a team is easier than one might think. Getting the right positioning for Ravage is probably the most difficult thing about playing Tidehunter, especially against teams that have ways of disabling your Blink Dagger preemptively. His strengths arguably outweigh his weaknesses, though, especially since he is one of the few heroes today that can still afford to go solo offlane. His durability in the lane combined with his independent nature means that the rest of the team can be more flexible with rotations and roaming—which can be a compelling strategy for some. Since Tidehunter is played pretty much exclusively as an offlaner, there is only one viable skill build for him. While this might seem to be a bad thing on paper, simplicity makes it easier for new players to settle into Tidehunter’s playstyle. The only time his skill build will ever diverge from the norm is when he faces heavy harassment from the enemy safe lane supports—and even then it’s just a matter of taking Kraken Shell before Anchor Smash. That said, Anchor Smash is your ideal first pick at the start of the game. Anchor Smash is a very cheap spell in terms of mana costs, and can be easily spammed in the lane in order to secure last hits. Of course, you shouldn’t just be casting it every time it’s off cooldown, or you will end up pushing the creep wave to the other side. Try to keep creep equilibrium within your area, just in case your opponents decide to dive you. Try to also get enemy heroes in your Anchor Smash when you go for creep kills, so that you can harass them back as well. Assuming everything proceeds normally, you should be getting Kraken Shell levels alongside Anchor Smash. Max out both abilities if you are still getting harassed/forced to farm in the jungle instead of the lane, but otherwise we recommend taking one point in Gush at Level 8. Make sure to invest points into Ravage whenever possible. As with any hero with an ultimate like his, Tidehunter requires a Blink Dagger in order to get the most out of his signature ability. Fortunately, he isn’t like other picks like Earthshaker, who struggle to even secure the farm they need to buy a Blink Dagger in the first place. Both Anchor Smash and Kraken Shell help immensely in this regard, allowing Tidehunter to farm neutral creep stacks without even breaking a sweat. The problem, though, is that Tidehunter has mana issues in the early game. To help alleviate this (and facilitate farming with Anchor Smash), we suggest getting yourself a pair of Arcane Boots to start with. Arcane Boots will supply you with more than enough mana to get through the laning phase, while farming up to your Blink Dagger. And that’s pretty much it for the mid game. Going into the late game, you’ll want to get items that benefit your team, such as Pipe of Insight when going up against magic-heavy lineups, and Shiva’s Guard for dealing with right-click carries. Refresher Orb is always there for when you really need to make a point using Ravage, though you should be aware of the active ability’s extremely high mana cost before even purchasing it. You’ll want to make sure you have the mana to support the refresh to begin with, or you might find yourself with no cooldowns but no mana to work with. Of course, if your supports are particularly gold-starved, then you might want to consider buying a Lotus Orb yourself—if you’re facing a draft that depends on single target abilities. Alleviating the pressure of itemization from your two supports can go a really long way, especially if they manage to get some of their own core items as a result. Owing to his straightforward playstyle, Tidehunter has a relatively simple rotation when going into teamfights. You’ll of course want to open with a Blink + Ravage combo, making sure to get as many heroes in the radius as possible. Remember that Ravage does take a while to reach its full radius, though, so you’ll want to be as close as possible to the targets you want to kill first. From there, it’s just a matter of using Anchor Smash and Gush whenever they’re off cooldown. Gush should probably go on heavily-armored heroes, or those with high movement speed. Anchor Smash, on the other hand, should be used on carries to reduce their right click damage. Although Kraken Shell’s strong dispel does help him remove nasty disables, it doesn’t remove everything under the sun. Picking heroes that have spells in the list of exceptions is a viable way to counter Tidehunter. Picks like Disruptor with his Static Storm, Outworld Devourer with his Astral Imprisonment, and Enigma with his Black Hole can keep him in place or totally immobilized. In the lane, Ursa can bully Tidehunter off the creep wave with Fury Swipes, as neither Kraken Shell nor Anchor Smash can dispel or reduce the additional damage, respectively. This eventually leads to Tidehunter being down in levels, which is bad news for him considering his dependence on Anchor Smash. If you have a particularly gifted support player in your team, consider picking Rubick. Ravage is one of the last spells you ever want to give away to a Rubick, after all. Just ask Dendi. And of course, spell immunity works wonders against Tidehunter, whose only way of dealing with Black King Bars and other forms of spell immunity is Anchor Smash. If you have good reflexes, you can even pop BKB as soon as Tidehunter blinks in to initiate, thus forcing him to either cancel the Ravage, or waste it entirely on heroes that aren’t affected by it.